The leader of the coalition governing Kurdish-held areas of Syria called on the international community to impose a no-fly zone over the northwestern enclave of Afrin to stop Turkish air strikes he said were killing innocent civilians. 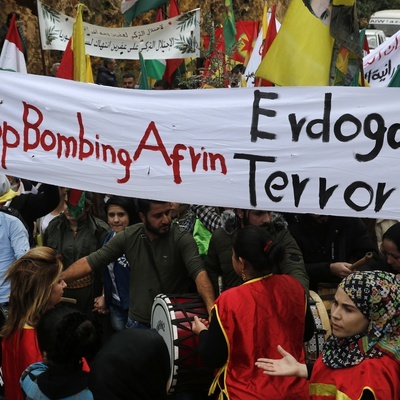 Turkey launched an air and ground assault on Afrin two weeks ago, pledging to destroy the People’s Protections Units (YPG) it says are linked to separatists Kurds fighting the Turkish state for more than 30 years. “We firmly believe that imposing a no-fly zone over Afrin would be useful to protect innocent civilians and put an end to Turkish aggression,” wrote Aldar Khalil, the co-chair of the Democratic Society Movement, on the U.S.-based DefenseOne website. The offensive has increased already strained tensions between Turkey and the United States, which has backed the YPG to largely defeat Islamic State (ISIS) and push the extreme jihadist group back to remote areas near the Iraqi border. Khalil accused Turkey of launching the Afrin operation in revenge for Kurdish victories against ISIS and hinted that Kurdish fighters, who make up the bulk of the U.S.-backed Syrian Democratic Forces (SDF), could be pulled away from the battle against the jihadist group to combat the Turkish offensive. Khalil said there were half a million people who had sought refuge in Afrin after being displaced by fighting in other areas of Syria. What is happening now in Afrin is in clear defiance of all international laws, norms, and values. We will fight. But we shouldnât have to.